The Los Angeles Chargers ended the 2017 season on a bit of a high note after dropping four straight at the beginning of the season. They won six of their last seven games and would have made the playoffs had they beaten the Kansas City Chiefs in a mid-December meltdown. Nonetheless, there is a lot to be excited about with this ultra-talented team. The Bolts have one of the better offenses in the league as they have an elite quarterback in Philip Rivers, a rising star in Melvin Gordon, and a top 10 pass catcher in Keenan Allen. They were one of four trios that had a quarterback pass for over 4,000 yards and a receiver and running back go over 1,000 yards. The Chargers averaged 376.6 yards per game as they finished fourth in the league. They struggled in running the ball at times as their 3.8 yards per carry average could have been better. Their woes in closing games, most notably hitting field goals, was a serious concern in their 0-4 start. Defensively, they finished third in the league in fewest passing yards allowed as Casey Hayward led the way. His Pro Football Focus grade of 96.4 is the second highest since 2006 as only Darrelle Revis’s 2009 campaign was better. He and Joey Bosa emerged as Pro Bowlers from the team as the Ohio State product racked up 12.5 sacks. However, the unit struggled stopping the run. With that being said, there are a few players to be excited about as they could help catapult the Chargers into the cream of the crop. OFFICIAL: We've signed kicker Caleb Sturgis to a two-year contract. Let’s be honest, Jake Elliott took the job from Sturgis after he nailed that improbable 61-yard field versus the New York Giants. Other than that, the former Florida place kicker has been a solid pro. He has made 81 percent of his field goals (111-of-137) and despite being a percentage point lower than Nick Novak’s 82 percent, Sturgis did not squander his job by missing kicks. Sturgis has some competition against Roberto Aguayo, but he has to be the favorite in this competition as Aguayo’s past mistakes might haunt him in pressure moments. If the former Gator can play like he did in 2016 when he nailed 35 field goals, the Chargers should win more games in 2018. Lamp was drafted last year in the second round by the Chargers as they were hoping he could help stabilize an inconsistent unit. The former Hilltopper has the ability to play guard and tackle and is known for his mean streak in the trenches as a balanced blocker. The Chargers offensive line did a good job of protecting Rivers as he was only sacked 18 times, the fewest for a starter with over 10 games. The reason Lamp will be a sight for sore eyes is because Anthony Lynn wants the offense to be able to run it more. As mentioned, the Chargers only averaged 3.8 yards per rush and 99.7 yards per game. He did have a knee surgery a few weeks ago, but Lynn described it as nothing too concerning. Look for Lamp to return and reinvigorate a lackluster rushing attack. 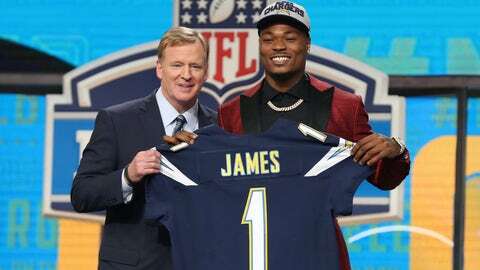 Sure, James is being added to the Chargers already elite secondary, but he was brought in to be an enforcer. He will be used in a similar fashion like Keanu Neal or Kam Chancellor as both the Falcons and Seahawks run defenses similar to the Chargers. After all, Gus Bradley has ties to the Seahawks and was on the same coaching staff as Dan Quinn in Seattle. At 6’3 and 210 pounds, the former Seminole has the ability to defend running backs and tight ends. However, James excels in defending the run as he flies to the ball after diagnosing the play. The Chargers are hoping their first round steal can help them improve their resistance against the run. Giving up 131.1 yards per game on the ground, 31st in the NFL, will not cut it if they want to make a Super Bowl run. Los Angeles is one of the most talented teams in the NFL, on paper. They are being pegged as one of the early favorites to win not only the AFC West, but the entire AFC. Sturgis, Lamp, and James will play a vital role in helping the Bolts meet those expectations.